You can order DIVINE BY CHOICE right now! Yea! FINALLY FINALLY FINALLY! Okay, here's the deal. Yes, the book isn't officially available until December, BUT my favorite local independent bookstore, The Book Place, is taking pre-orders now. (My books usually get there at least a couple weeks before they're available at major bookstores and Amazon.) So, you can order DIVINE BY CHOICE (with a lovely 15% discount!) through The Book Place and before they ship it to you I will march my little self down to the store and sign it for you! Yes, you can get a copy of DIVINE BY MISTAKE signed by me, too. Find out for yourself why RT gave P.C. Cast's DIVINE BY CHOICE a 4 1/2 star rating Top Pick review!!! 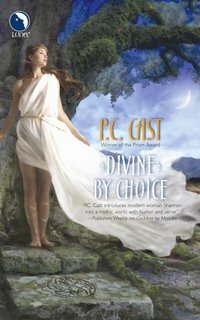 Pre-order your copy of DIVINE BY CHOICE (LUNA Dec., 2006), the long awaited sequel to GODDESS/DIVINE BY MISTAKE and receive a copy signed by P.C. Cast at 15% off the cover price! RT said, "With Cast's imaginative style, expectations are high for this second book in the Divine series, and it delivers. Superlative world-building and a modern, sarcastic heroine make this an accessible and delightful read. 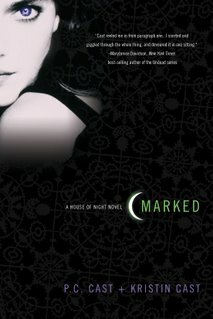 The first of this series, Goddess by Mistake, earned a 4 1/2 star rating; the updated reissue, Divine by Mistake, is even better. While Divine by Choice can stand on it own, pick up both of these treasures for your keeper shelf." If you would like to receive a signed copy of DIVINE BY MISTAKE (LUNA Sept., 2006) you can place that order during this promotion period and also receive 15% off the cover price! TO RECEIVE THIS SPECIAL OFFER be sure to include in the “Question or Message” section of the order form “Pre-Order Promo for P.C. Cast”. TO HAVE THE SIGNATURE PERSONALIZED: Be sure to include in the “Question or Message” section of the order form the name of the person you would like included in the inscription. Otherwise the book will have only the signature of P.C. Cast. HOW TO ORDER: This pre-order special will be available only through The Book Place in Broken Arrow, Oklahoma. Please visit http://www.the-bookplace.com to place your order today! Click on “Search Inventory” in the menu, type in the title of the book you wish to order and submit. The Book Place can be reached by phone at (918)455-1422. Happy ordering guys! The long wait for DIVINE BY CHOICE is finally over!